he second weekend of my Spring Break we were able to go away for a night, which I really appreciated. 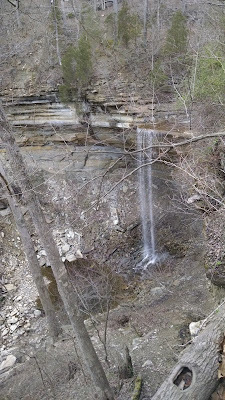 I have been wanting to check out Clifty Falls State Park in Madison, IN, and since it is spring, figured now would be a good time to go see the waterfalls there. My first wild turkey sighting! They crossed in front of the road and we got to watch them for several minutes. Virtually every time take a road trip (of any length), Eric sees turkeys on the side of the road. I never see turkeys. He thinks I am blind; I think he is messing with me :) But I finally saw some. 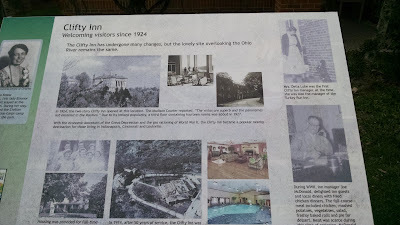 The dining room at the inn has some really neat paintings on the walls. After filling up, we drove over to our first trailhead. 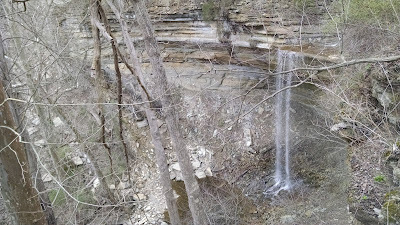 We decided to do a couple of trails that would take us to see all of the waterfalls, starting with Hoffman Falls, which has an overview right next to a parking lot, continuing on trail 4, then merging with trail 5 to see Tunnel Falls. The first step was to bundle up. It was not particularly warm (we each had on some combination of long sleeve shirt, sweater/hoodie, and jacket), especially because it was cloudy. Then we walked down the short path from the parking lot to the Hoffman Falls overlook. "That's it?" we thought. We had both expected there to be a lot more water. It had stormed heavily less than two days before our visit, and we thought the water would be flowing similar to the falls at McCormick's Creek or Cataract after a rain (gushing). Unfortunately this is apparently about as heavy as the falls get at this park. We still had a good time hiking but if you are wanting heavy falls you might want to check somewhere else. Most of the trails at Clifty Falls are marked as rugged on the map, and that's pretty accurate. We had a good time on the trails since they were more challenging than a lot of others near home. You also get quite a bit of elevation change (we had our Fitbits measuring the hike, and both of us got somewhere around 560-580 ft elevation gain for this hike). One of the main stories at Clifty Falls is that a railroad attempted building a track straight through the park (before it was a state park, of course) to connect Madison with Indianapolis. Unfortunately the elevation was so great a challenge to overcome that building was abandoned. 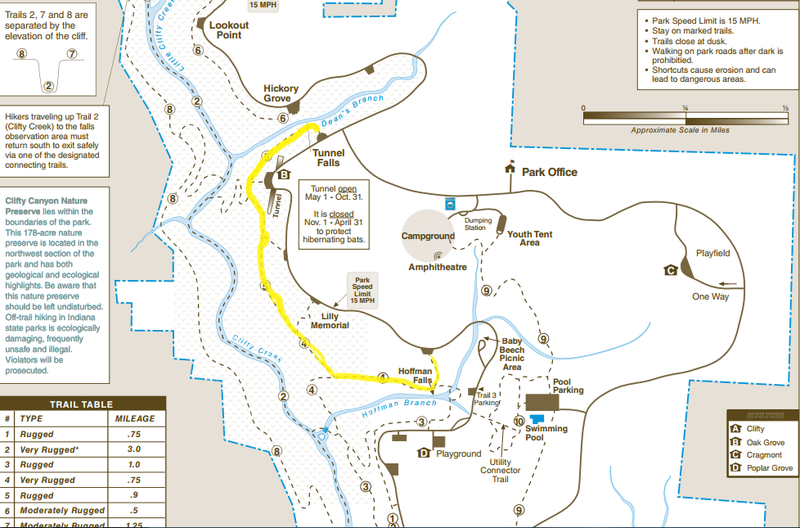 The remnants of the attempt are still very visible, especially on trails 4 and 5. Civil engineering is something I wish I knew how to do (I feel this way about most engineering fields). How fascinating is it to think about people in the 1800s figuring out where to put massive amounts of stone to build a train trestle through an enormous ravine! 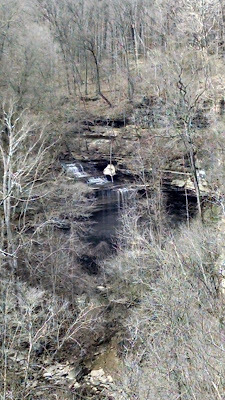 The only mar on the landscape around Clifty Falls (and in Madison in general) are the giant smokestacks from the Madison coal plant, the Clifty Creek Power Plant. Crazy fact: the tall chimneys are the same height as the Eiffel Tower. We found lots of small, unnamed waterfalls on the hike. They are fun to watch close up, since you can't really be close up with the bigger falls. Along with the trestle building, you can find a tunnel. We did not go through it (it's actually closed each winter until April 30th, to try to protect the hibernating bats). It seemed wet and very dark. 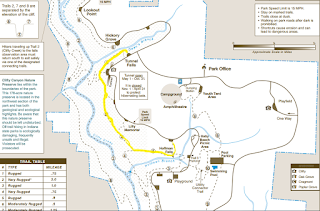 The map recommends a flashlight if you hike through in the summer. But we did read about it and I walked up to the opening. Past the tunnel is Tunnel Falls, the second named waterfall we planned to see. At this point we were on trail 5. The trails are well marked with signposts. Here is the other end of the tunnel. And here is Tunnel Falls. Tunnel Falls is also easily accessible from a parking lot off the main road. There is a viewing platform. I recommend walking down the trail path a little bit as well, to get photos from farther away and a different angle. I tried to play with some camera settings here (one of my goals is to take great photos of water). The hike back to the car didn't feel very long. The sun came out and we warmed up quickly, and it felt great. Even if the falls weren't as dense as we were hoping, the hike was still really nice and well worth it. 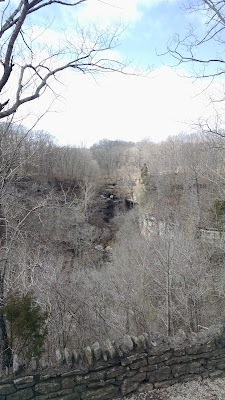 We did another hike at Clifty Falls after this one which you'll see tomorrow. It was much shorter since we were tired from this hike (the elevation and ruggedness were not what we were used to). I recommend heading to Clifty Falls if you want some interesting trails to traverse.